Business meetings: As announced, or 6:00 PM if preceding regular meeting. Keep in mind that events may occasionally be subject to changes or cancellations. Check this website the day of the event for any last-minute updates. Regional and national events are listed for the convenience of members who may wish to attend these events. See the linked websites for more information and updates, and make your travel plans well in advance. Contact us for more information about club events. 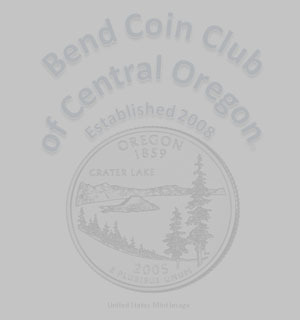 E-mail: bendcoinclub@hotmail.com, Phone: 541-647-1021 (Eric Holcomb). Beginning September 2016, the new Bend location is the community room (clubhouse) at Suntree Village, 1001 SE 15th St., Bend, OR. As of January 2014, the club will alternate between Redmond and Bend meeting locations, except that both the June and September meetings will be in Bend due to the possibility of the PatRick facility being busy throughout the summer. The board decided to follow the same arrangement in 2015 and 2016, except that 2016 meetings (February to October and December) were moved to the second Tuesday of the month. The second Tuesday is now the regular meeting night. See the calendar below for the location for each scheduled meeting. From south (Highway 97 from Bend) - Use NE Hemlock Ave exit (north of Hwy 126 and Antler Ave), then proceed to NE 11th St. PatRick is on the left just past that intersection. From east (Highway 126 from Prineville) - Use NE 9th St (McCaffrey Rd) exit, proceed north to NE Hemlock Ave, then right to NE 11th St as above. The clubhouse is located at the south entrance to Suntree Village (South Suntree Drive), nearest to Reed Market Road. As you enter go up the hill and it is on your left; there's a mailbox in front of it, and parking is available on both sides of the street. From north (on SE 15th) - Go past the north Suntree entrance, then take the next right (before the roundabout at Reed Market). From south (on SE 15th) - The south Suntree entrance is the next left turn after the roundabout at Reed Market. If you are coming on Highway 97 (either direction), take the Reed Market exit (to the east), then turn left at the roundabout onto SE 15th. Regular meetings are held on the second Tuesday unless otherwise announced. MAY 14 Regular Meeting Redmond, Oregon (see above). To be announced. Also show & tell with random prize(s) to participants, plus an auction from about 8:00 to 8:30 p.m., or at end of meeting, if requested. Auction form. JUN 11 Regular Meeting Bend, Oregon (see above). To be announced. Also show & tell with random prize(s) to participants, plus an auction from about 8:00 to 8:30 p.m., or at end of meeting, if requested. Auction form. JUL-AUG No summer meetings scheduled - enjoy your summer vacation! APR 21-27 ANA National Coin Week Nationwide Theme: "Discover the Past, Envision the Future."